In the outer reaches of Metro-land, in a Buckinghamshire village overlooking the Chess Valley, sits an impressively historic Tudor house called Chenies Manor. 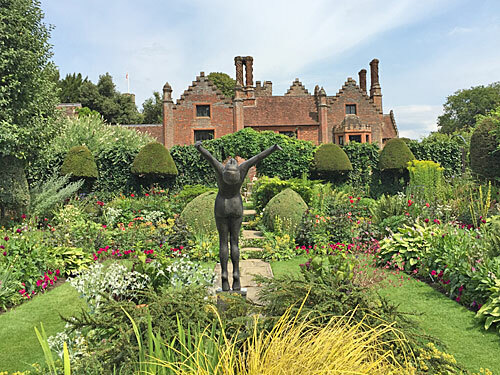 King Henry VIII and Queen Elizabeth I have been, and finally so have I, to see the lovely house and its lovely gardens overseen by some lovely volunteers. What stopped me visiting before was that it's only open for three hours on a Wednesday and a Thursday, and only in summer, so it's very much a destination for the retired brigade who like a bit of heritage and a nice garden and a sit down with some tea. But if you can actually get there, it's very much not just for them. The original site's medieval, the current house having been started in the 1530s by John Russell, one of Henry VIII's rising courtiers. He needed a home grand enough to support a visit by the entire royal court, and being a day's horseride from London helped to attract them more than once. The royal apartments are long since demolished, but a later extension with twirly chimneys (knocked up by the same builders who did Hampton Court) survives. The Russells later became the Dukes of Bedford, and duly moved to Woburn, which led to the buildings entering a slow decline. But everything turned round in the mid 1950s when the MacLeod-Matthews family bought the place at auction and set about restoring the house and its grounds. They've done an utterly enviable job. It's £5 to see just the gardens, and £8 all-inclusive to throw in a tour of the house as well. You'd be a fool not to go for the latter, but make sure you arrive early enough to get your name down. I swanned in ten minutes after opening and all the tour spaces for the next hour were fully taken, thanks to the arrival of a coach party of grey-haired culture-seekers from Surrey. The grounds aren't enormous, and I wondered if they'd sustain me for the next sixty minutes, but in the end there was more than enough to see without resorting to the default behaviour of pointing at the flower beds and saying "ooh that's nice, I wonder if we could get that for home". The gardens are gorgeous, especially the beds along the bricked-up south wall, and the sunken garden to the west of the main house. Elizabeth MacLeod-Matthews spent over 60 years of her life making them bold, colourful, dense and vibrant, with a particular fondness for dahlias, although I was most taken by the alliums and silver thistles. Various modern sculptures are dotted here and there, some of them for sale to those with bottomless pockets. A separate kitchen garden is laid out with labelled blooms and vegetables, plus a large walkable labyrinth (more technically a maze, but with only three paths, two of which are dead ends, so no great challenge). A far finer hedge maze appears on the main lawn - unlabelled, so I wasn't initially sure that's what it was. But when I slipped inside I discovered a highly original puzzler, based on equilateral triangles and with connections in the corners. 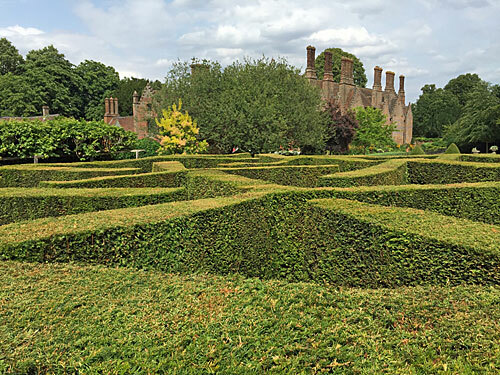 The gaps in the hedge are narrow, and larger visitors should expect to do some squeezing, but the disorientation provided by the angular layout makes for a properly challenging quest round a fairly compact space. On my first attempt I was happy enough just to get out, but on my second I serendipitously found the centre where a raised platform affords a view out across the tops of the hedges and I was well chuffed. Don't look at this spoiler photo if you plan to venture inside yourself. A small physic garden has been laid out beyond the far wall, with herbs and medicinal plants arranged by category, including a separate penned-off section for poisonous specimens. The strange building in the corner is the wellhouse, built over the manor's original source of water, a 170m deep well. That's deeper than Nelson's Column is tall, which is a bit of a coincidence because John Noakes has scaled them both, in this case with the local cave-diving club in the 1970s. A huge amount of 'rubbish' was removed from the well at that time, the most interesting finds being displayed in cases around the wellhead along with, somewhat randomly, a collection of vintage lawnmowers. The house tour, when you're finally ready for it, is a strictly no-photos affair. That's because Chenies Manor remains a family home, indeed you might see the family out and about in the grounds when you visit. The Long Gallery is a lovely timbered room bedecked with drapes and paintings, although apparently it didn't look quite so grand until very recently, and has in the past been commandeered as a dining hall for the adjacent primary school. The other downstairs rooms look less historic, but chintzier and cosier, and have been used for many a Midsomer Murder (amongst a long list of the manor's other film and TV credits). Watch out for the squint window and the brick handrail as you ascend to the first floor. 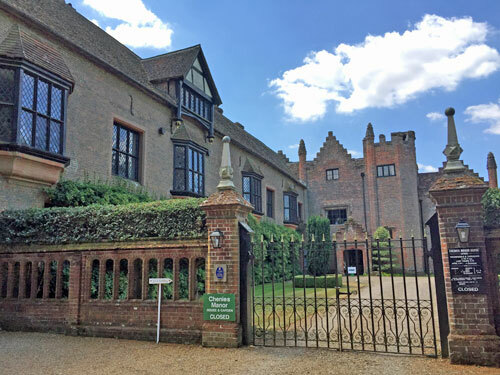 Henry VIII was too portly to climb the staircase on his later visits, so never saw what fifth wife Katherine Howard was up to with Thomas Culpepper in the upstairs bedroom, and adultery at Chenies Manor was cited in the evidence that led to her later execution. Queen Elizabeth I signed the death warrant for her cousin Mary Queen of Scots up here too, allegedly without looking. Other treats on the first floor include an Elizabethan toilet, a priest hole, a room full of dolls, some splendid portraits, a model of the Golden Hinde and several examples of the handiwork of the local flower club. What an unexpectedly great hour that was. 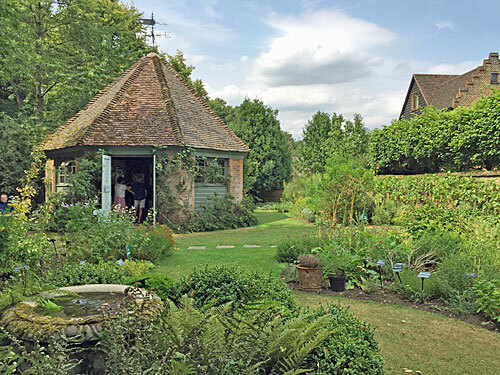 Other bits to see at Chenies Manor include the cafe, naturally, where tea and cakes can be taken out onto the lawn. A gift shop sells choice gifts of a bohemian kind, rather than 50p souvenir pencil sharpeners. A well hidden annexe is used to display a local artists's paintings. 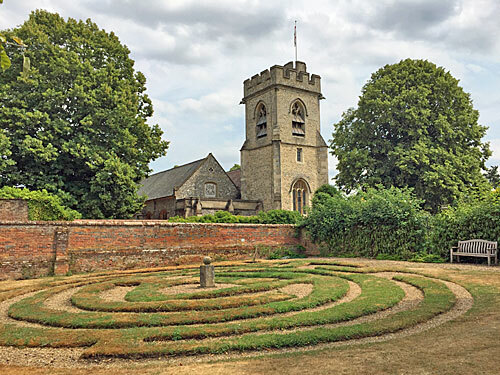 And don't forget St Michael's church nextdoor, whose most striking feature is a huge mausoleum where the Dukes of Bedford used to be buried before the family left for Woburn - you can peer through, but not enter. From wondering how I'd fill an hour, I ended up spending almost the full three hour allocation in and around the house and gardens. Visit soon (or I suspect if you wait long enough, a pensioners' coach trip will bring you here eventually). by tube: The two nearest stations are Chalfont & Latimer and Chorleywood on the Metropolitan line. Chorleywood used to be called Chorley Wood and Chenies, so you might think it was nearer, but I walked in slightly faster from the former - it's about half an hour from both. by bus: Nah, not any more. Ever since I was very little, the 336 has shuttled from Watford out towards this corner of Bucks, but last month they changed its number to 103 and the route's been tweaked so it no longer runs through Chenies village. Car-less residents now need to walk down to the main road, which includes a stretch of lane with no pavement, to pick up the hourly service there. I suspect there aren't many car-less residents.